Thinking about Brazil, Curitiba is not the first thing that comes in mind. The city has been surprising travelers from all over the world and is becoming popular over the years. Once in Brazil you can’t leave without going to Curitiba. Curitiba is the capital city of Parana State, located 1 hour and 20 minutes from Rio de Janeiro and only 30 minutes from São Paulo by plane. The city is considered one of the best places to live in Brazil because of its great infrastructure. Doesn’t matter what your looking for, Curitiba is an awesome city for everyone and has a lot of interesting things to do/see like famous parks, museums, night clubs, restaurants, bars, soccer stadiums, squares, buildings, etc. There are also a lot of touristic attractions around the city like famous islands (Ilha do Mel and Ilha de Superagui), historic cities like Morretes, Antonina, Castro, etc. First of all, Curitiba has a really fun and exciting nightlife, with plenty options of bars, nightclubs, pubs where the partying doesn’t stop until 5 or 6 in the morning. This added to the Brazilian partying and entertainer spirit, guarantee the night. Curitiba has also great options of restaurants that serve really good food and most of them are cheap. Besides the Brazilian stake houses as known as “Churrascarias” and typical Brazilian restaurants, the gastronomy in Curitiba is a synthesis of habits and cultures. Italian, Arabs, Poles, Germans, Portuguese, Japanese among many other, brought their habits, traditions and culinary to the city. However, since you’re in Brazil you must prove the delicious local culinary. The city has three soccer teams. Atlético Paranaense plays the 1st division of the Brazilian Championship and Coritiba and Paraná play on the 2nd division. Watching soccer games is a really interesting and exciting experience in Curitiba, especially at Atlético’s stadium called “Arena da Baixada”. The stadium was selected to be one of the headquarters stadiums for the FIFA World Cup in 2014. At the stadiums you can feel the energy and passion that the Brazilians have for soccer and their teams. Curitiba has so many tourist attractions. However, the highlights are Jardim Botânico (Botanical Garden), the handcrafts market at Largo da Ordem, Oscar Niemeyer Museum, Ópera de Arame (Wire Opera House), Largo da Ordem (Old town), Tanguá Park, Barigui Park, Brasil Telecom/OI’s Tower, Passeio Público and the historical building of the Federal University of Paraná. The Jardim Botânico (Botanical Garden of Curitiba) is modeled like the French Gardens is a great place to go stroll and relax. The parks are also a great option for that and locals enjoy a lot the green areas of Curitiba . The Feirinha do Largo da Ordem (handcrafts market) happens every Sunday at Largo da Ordem. At the market you can find local handcrafts and all kinds of food. Most tourists really like the fresh pastéis, caldo-de-cana (sugar cane juice), bolinho de bacalhau. 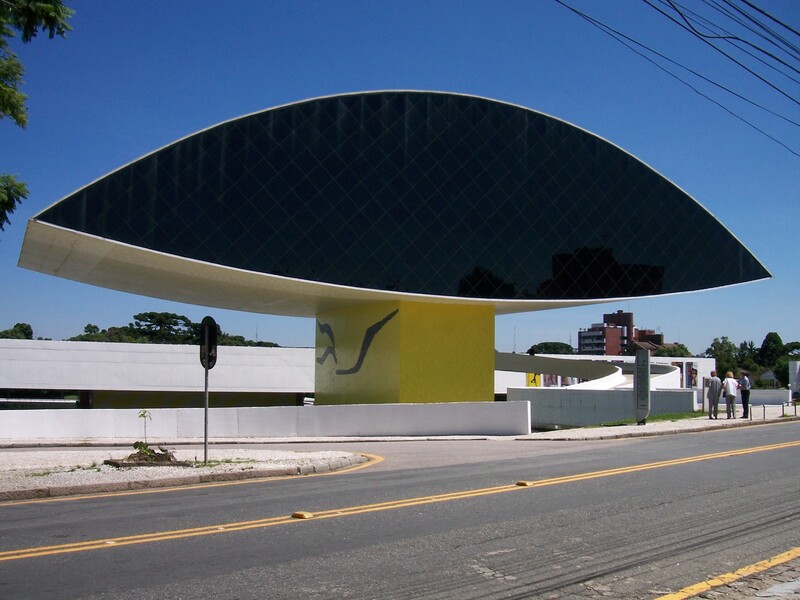 There are always exhibitions of famous artists at the Oscar Niemeyer Museum . The museum was drawn by the famous Brazilian architect Oscar Niemeyer and it’s architecture impress everyone that pass by the local. On the field behind the museum, on Saturday the kids practice football (yes…American footbal, NOT soccer) and on Sunday a lot of people go to the field to play with their dogs. Visit the Torre da OI/Brasil Telecom is worthwhile. The tower has more than 100 meters , where you can have an amazing panoramic view of Curitiba. At Praça Santos Andrade, located in downtown you can check the Teatro Guaíra and the beautiful building of the Federal University of Paraná , the first university in Brazil. The Tourism Line in Curitiba is a great option for tourists. For R$20.00, the bus line pass by the main tourist attractions in Curitiba and gives you the option to stop off at three points of your choice. The buses circulate every 30 minutes, in an approximately 45 km trip that takes around 2.5 hours to complete. Once in Curitiba , the train tour to Morretes becomes a “must do”. The construction of the railroad in 1880 was one of the big challenges of that time for engineers. The track starts in Curitiba at 934 m above the sea and goes until Morretes just a few meters above sea level. It is one of the most impressive train rides of the world because of the tropical vegetation of the Atlantic Rain Forest , breathtaking bridges, turns and gorgeous landscapes. This is just a really short description about Curitiba. For more information web sites like Descubra Curitiba and Viaje Curitiba are really helpful to tourists, however, they are in Portuguese. For english speakers here you can find general and complete information in english about Curitiba and surrounding areas. From: Traveler article on Trip Advisor.